Artists love buying Prismacolor marker sets because the manufacturer has an excellent reputation in the industry. 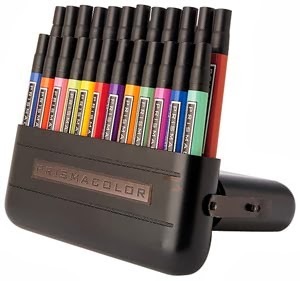 The most popular set of markers from this company has 144 unique colors with non-toxic ink. While the ink in many company’s markers fades, the colors provided by a Prismacolor marking pen lasts forever. When buying a 144 set, customers receive 140 versatile pens with a cap at each end. Each of these pens has both a fine and broad nib, providing a way for artists to use the device for fine lines or broad strokes. In addition, the set includes four metallic markers in two colors that have one nib each. Anyone buying these markers wants to know some important tips and tricks to keep the items in tip-top condition. In the excitement of having a new set of markers, someone may forget to protect the items from damage. One of the most important things to do is keep the markers in a case to protect the plastic coverings. The 24 and 48 piece marker set arrives in its own hard case, but artists can find separate cases for the larger sets of pens. When artists keep the markers inside a case while transporting the pens, it helps to prevent cracks in the casings or caps falling off. While using the markers to create an artistic drawing, make sure to open one pen at a time to avoid having the ink dry. With this method, artists also prevent the different colors of pen nibs from bumping each other. An additional way to protect the tips of the markers is by not dropping the pens on the floor or tabletop surfaces. Artists should only use the markers on sturdy paper that does not shred and clog the tip of the pen. If a marker requires cleaning, use the recommended solution to avoid damaging the sensitive nib and casing. Store Prismacolor marker sets at the correct temperature to prevent freezing or melting that will damage the integrity of the ink colors.